A slow but enjoyable empire builder, with just a hint of Viva Pinata. Even just a few days ago we'd have struggled to summon up much enthusiasm for yet another iOS empire-building game. The genre's become over-saturated beyond belief, and there's very little to distinguish the big titles from one another. Mention the addition of a Viva Pinata flavor to the experience though, and our ears prick up with just a little more interest. 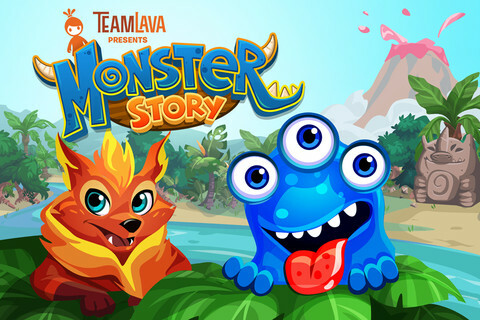 In Monster Story, you're building a paradise for the outlandish creatures that grow in eggs and then populate your sprawling island. Each monster you hatch requires a habitat that matches its color and, once happily settled in its new home, it'll generate coins for you so you can invest deeper into the game. If you need more money, you can level the critters up using food grown on your farms, and they'll reward you with more booty as a result. Once they've reached a certain level, you can start evolving them into more valuable beasts, or breed them with different species altogether to create entirely new types of critters. 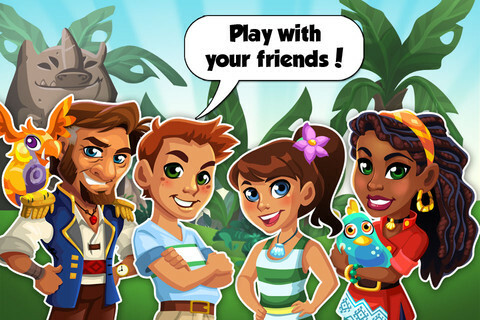 Here's where the Viva Pinata feel makes its presence known, and it's a blast to visit other players' islands and see what unlikely creations they've managed to concoct. You're led gently by the hand through the game's expansion thanks to an elegant mission interface that encourages you to clear weeds, plant new constructions, or hatch brand new monsters. Successfully completing these missions grants you even more game currency. 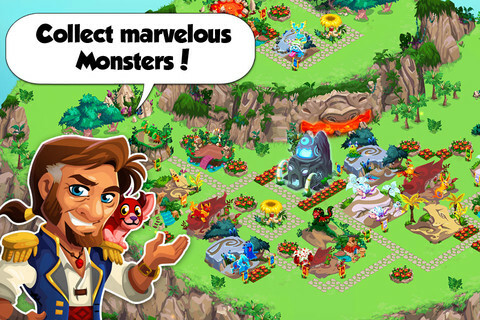 As we've come to expect from the free-to-play empire-building genre, Monster Story has its share of sins for those with lighter wallets. Missions sometimes come in the form of a request to download another game. True, they expire after a week but they're annoying nevertheless. The cost of game currency in the cash shop is eye-watering too, so don't expect to be buying your way to success at a bargain price any time soon. For all its charm and environmental diversity, your progress in Monster Island also grinds down to a slow pace very quickly. 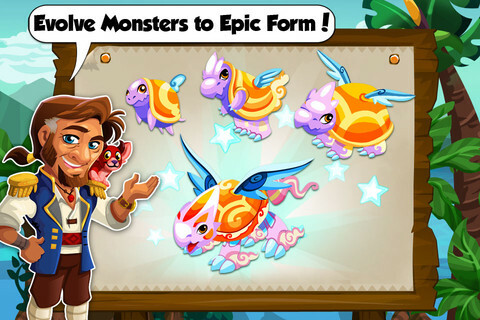 The monsters become too expensive to hatch, expanding your territory by clearing forest takes longer and longer, and then eventually you lose the motivation to continue. Make a mistake when placing a construction during the tutorial (as we did), and it'll be a long time before you can make progress through some of the expansion-orientated missions. There's sadly no option to delete a structure once it's been built, unless it's been hidden deep within an otherwise crisp interface. You can move them once built, but it's little consolation if you lack additional space to move them into. Still, we had fun while it lasted in Monster Story. Those with a fondness for empire-building games, and who long for a revival of the Viva Pinata franchise will get much from the game, just as long as they also have a great deal of patience to go along with that passion. What's Hot: Refreshing different genre gameplay, with clear missions and an elegant social component. What's Not: Progress slows rapidly, and further expansion requires a great deal of time investment.